Urban Harvester announced today that it received a $50,000 grant from Wells Fargo to help reduce hunger while reducing organic food waste in the Greater Bay area. The grant will enable Urban Harvester to bring its model program of rescuing fresh food to the Bay Area and positively impact the 829,547 people or 11.3% of the region’s population of residents who are living in Poverty. Urban Harvester’s model, initiated in Southern California, provides sustainable access to rescued fresh nutritious food for individuals and families often having to choose between keeping a roof over their heads or food on the table struggling to accomplish both. Participating Bay Area social service agencies will be able to reduce and redirect scarce funding resources from the purchases of fresh food toward other essential life sustaining services. 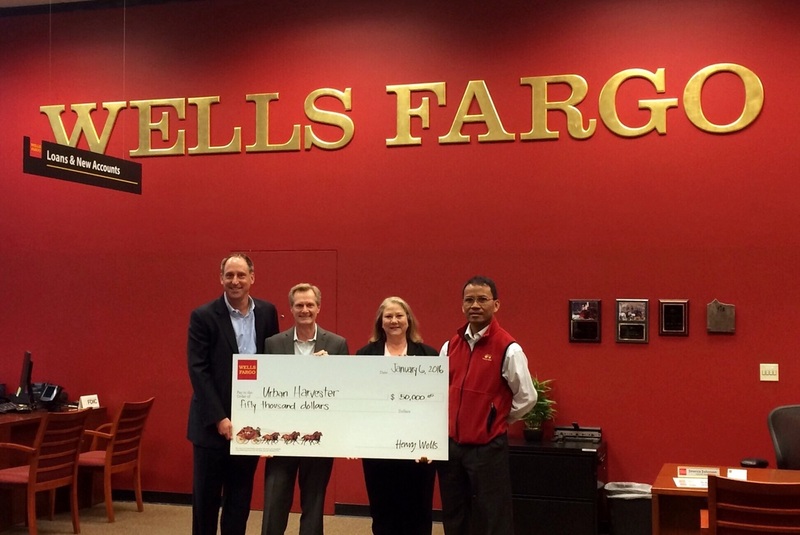 “As part of Wells Fargo’s broad environmental commitment and serving the communities where we operate, we are proud to support the Urban Harvester program because its innovative model will go a long way into helping address hunger and excess food waste in our communities, ” said Eric Houser, Executive Vice President of Technology Banking Group at Wells Fargo. Urban Harvester is working in partnership with Joint Venture Silicon Valley on a hunger and waste reduction initiative based on JVSV's State of the Valley 2015 Poverty in the San Francisco Bay Area research brief. Established in 1993, Joint Venture Silicon Valley is a nonprofit organization that provides analysis and action on issues affecting our region’s economy and quality of life. Joint Venture is nonpartisan and politically neutral. It does not lobby or advocate for political candidates or ballot measures. The organization brings together established and emerging leaders from business, government, academia, labor and the broader community to spotlight issues and work toward innovative solutions. Since 1995, JVSV has published the Silicon Valley Index, a detailed report that measures the strength of our economy and the health of our community, highlighting challenges and providing an analytical foundation for leadership and decision making. About Urban Harvester Urban Harvester is a 501(c)3 nonprofit corporation founded in 2012. Since 2009, Urban Harvester has worked across Southern California to come up with sustainable solutions to minimize food waste. We help local food producers and food retailers have connected with social service agencies to keep fresh food from entering the waste stream and instead redirecting it to help feed the food insecure. *Bay area data provided by the Joint Venture Silicon Valley ; 2015 Greater Bay area Poverty Report.